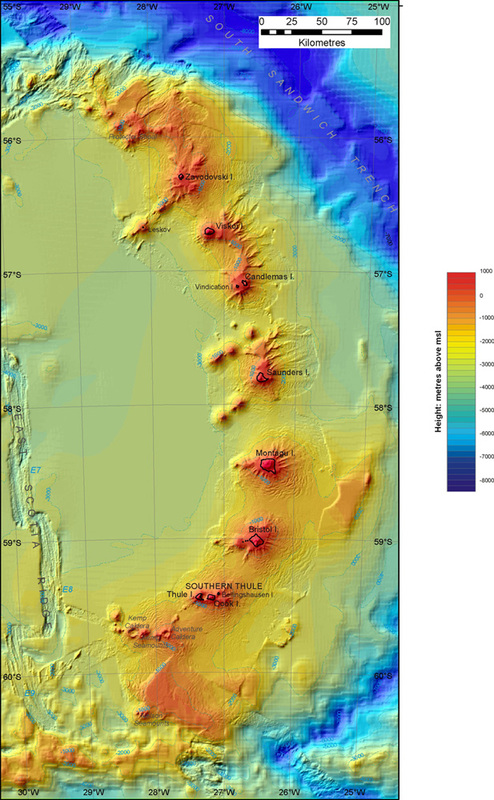 Scientists from British Antarctic Survey (BAS) have discovered previously unknown volcanoes in the ocean waters around the remote South Sandwich Islands. Using ship-borne sea-floor mapping technology during research cruises onboard the RRS James Clark Ross, the scientists found 12 volcanoes beneath the sea surface - some up to 3km high. They found 5km diameter craters left by collapsing volcanoes and 7 active volcanoes visible above the sea as a chain of islands. The research is important also for understanding what happens when volcanoes erupt or collapse underwater and their potential for creating serious hazards such as tsunamis. Also this sub-sea landscape, with its waters warmed by volcanic activity creates a rich habitat for many species of wildlife and adds valuable new insight about life on earth.